Zweibrücken, Germany- Large amounts of post-consumer laminated plastic packaging can be separated from adhesive labels quickly and efficiently with the HydroFiner from Pallmann. The company is one of the world’s leading developers and suppliers of recycling technology and equipment. The HydroFiner made his debut on Pallmann’s stand at K2013. Legislation around the world sets strict criteria on disposal of packaging waste, and there is even discussion in some industrialized countries of new laws that would enforce waste handling within the region where it is created. Pallmann anticipates increasing demand for recycling plants to handle this waste. With its decades-long experience in recycling technology, the company is already in a strong position to meet needs for a wide range of recycling needs. Now, with the introduction of the HydroFiner, Pallmann is offering a new solution for removing labels from laminated plastic for paper packaging that will facilitate recycling in high volumes. The HydroFiner uses hydro-mechanical action to remove sticky cellulose-based laminate from packaging, yielding high quality clean material for further processing. Large amounts of packaging waste created along the supply chain are relatively clean, but less than simple to recycle because they include paper labels, often attached with strong adhesives. The traditional method of recycling such waste is to granulate it and reprocess it in an extruder. However, this requires a lot of melt filtration and frequent changes of melt filters. It may be possible to remove the labels by washing the packaging, but this most probably will require the use of hot water, which obviously consumes energy; the alternative use of solvents introduces another cost. “We decided to develop the industrial equivalent of rather basic methods that are already used in developing countries, where large amounts of film waste are handled today,” says Mr. Rolf Gren, Senior Executive VP PALLMANN Group. “There, the labels are often removed by vigorously brushing them off manually. We wanted to mimic this process—and obviously improve on it—in a machine. 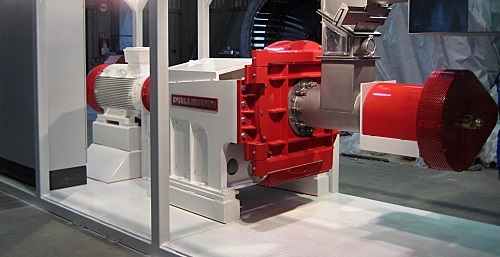 The process, for which Pallmann has applied for a patent, is based on two discs—a rotor and a stator–with material being fed to the centre via an augur, and then moving to the outside through pairs of intermeshing teeth. The time the material is retained between the discs can be adjusted by changing the speed of the rotor and by adjusting the amount of water. The water is injected at three separate locations to provide increased precision, and is recycled back into the system after use. The HydroFiner is capable of throughputs of up to 1800 kg/hour of packaging waste.